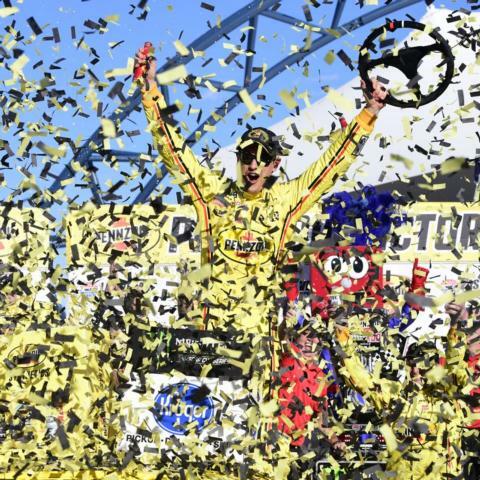 March 12, 2017--Kobalt 400, won by Martin Truex Jr.
March 10, 2012--Sam's Town 300, won by Ricky Stenhouse Jr.
March 9, 2013--Sam's Town 300, won by Sam Hornish Jr.
Oct. 15, 2011--Smith's 350, won by Ron Hornaday Jr.
Sept. 29, 2012--Smith's 350, won by Nelson Piquet Jr.
April 21, 2000--IRL Vegas Indy 300, won by Al Unser Jr.
April 7, 2002--Third Annual NHRA SummitRacing.com Nationals, won by Larry Dixon (TF), Gary Densham (FC) and Ron Krisher (PS). Oct. 28, 2002--Second Annual NHRA ACDelco Las Vegas Nationals, won by Larry Dixon (TF), John Force (FC), Jeg Coughlin (PS), Angelle Savoie (PSB). April 6, 2003--Fourth Annual NHRA SummitRacing.com Nationals, won by Larry Dixon (TF), Tony Pedregon (FC) and Greg Anderson (PS). Oct. 26, 2003--Third Annual ACDelco Las Vegas NHRA Nationals, won by Kenny Bernstein (TF), Tony Pedregon (FC), Greg Anderson (PS) and Craig Treble (PSB). April 4, 2004--Fifth Annual NHRA SummitRacing.com Nationals, won by Tony Schumacher (TF), Phil Burkhart (FC) and Greg Anderson (PS). Oct. 31, 2004--Fourth Annual ACDelco NHRA Las Vegas Nationals, won by Doug Kalitta (TF), Gary Scelzi (FC), Greg Anderson (PS) and Chip Ellis (PSB). April 17, 2005--Sixth Annual NHRA SummitRacing.com Nationals, won by Larry Dixon (TF), Whit Bazemore (FC) and Dave Connolly (PS). Oct. 23, 2005--Fifth Annual ACDelco Las Vegas Nationals, won by Tony Schumacher (TF), Ron Capps (FC), Kurt Johnson (PS) and Chip Ellis (PSB). April 9, 2006--Seventh Annual NHRA SummitRacing.com Nationals, won by Melanie Troxel (TF), Cruz Pedregon (FC) and Kurt Johnson (PS). Oct. 29, 2006--Sixth Annual NHRA ACDelco NHRA Las Vegas Nationals, won by Tony Schumacher (TF), Jack Beckman (FC), Richie Stevens (PS), and Andrew Hines (PSB). April 15, 2007--Eighth Annual NHRA SummitRacing.com Nationls, won by Brandon Bernstein (TF), Robert Hight (FC), Greg Anderson (PS). Oct. 28, 2007--Seventh Annual NHRA ACDelco Las Vegas Natiuonals, won by Rod Fuller (TF), Tony Pedregon (FC), Greg Anderson (PS) and Andrew Hines (PSB). April 13, 2008--Ninth Annual NHRA Summitracing.com Nationals, won by Cory McClenathan (TF), Tim Wilkerson (FC) and Jason Line (PS). Nov. 2, 2008--NHRA ACDelco Las Vegas Nationals, won by Tony Schumacher (TF), Cruz Pendergon (FC), Jeg Coughlin Jr. (PS) and Chris Rivas (PSM). April 5, 2009--NHRA Summitracing.com Nationals, won by Tony Schumacher (TF), Ron Capps (FC) and Jeg Coughlin Jr. (PS). Nov. 1, 2009--NHRA Las Vegas Nationals, won by Spencer Massey (TF), Robert Hight (FC), Larry Morgan (PS), Andrew Hines (PSB). April 18, 2010--NHRA Summitracing.com Nationals, won by Larry Dixon (TF), John Force (FC), Mike Edwards (PS). Oct. 31, 2010--NHRA Las Vegas Nationals, won by Tony Schumacher (TF), John Force (FC), Greg Anderson (PS), L.E. Tonglet (PSB). April 3, 2011--NHRA Summitracing.com Nationals, won by Antron Brown (TF), Robert Hight (FC), Mike Edwards (PS). Oct. 30, 2011--NHRA Big O Tires Nationals, won by Del Worsham (TF), Ron Capps (FC), Mike Edwards (PS). Oct. 28, 2012--NHRA Big O Tires Nationals, won by Bob Vandergrift Jr. (TF), Ron Capps (FC), Allen Johnson (PS), Eddie Krawiec (PSB). April 7, 2013--NHRA Summitracing.com Nationals, won by Tony Schumacher (TF), Cruz Pedregon (FC), Allen Johnson (PS). Oct. 27, 2013--NHRA Toyota Nationals, won by Antron Brown (TF), John Force (FC), Shane Gray (PS), Matt Smith (PSB). March 30, 2014--NHRA Summitracing.com Nationals, won by Tony Schumacher (TF), Alexis DeJoria (FC), Erica Enders (PS). Nov. 2, 2014--NHRA Toyota Nationals, won by Spencer Massey (TF), Del Worsham (FC), Erica Enders (PS), Andrew Hines (PSB). April 12, 2015--NHRA Summitracing.com Nationals, won by Richie Crampton (TF), John Force (FC), Erica Enders (PS). Nov. 1, 2015--NHRA Toyota Nationals, won by Doug Kalitta (TF), Robert Hight (FC), Erica Enders (PS), Andrew Hines (PSB). April 3, 2016--DENSO Spark Plugs NHRA Nationals, won by Antron Brown (TF), Alexis DeJoria (FC), Jason Line (PS). Oct. 30, 2016--NHRA Toyota Nationals, won by Steve Torrence (TF), John Force (FC), Shane Gray (PS), Jerry Savoie (PSM). April 2, 2017--DENSO Spark Plugs NHRA Nationals, won by Antron Brown (TF), Tommy Johnson Jr. (FC), Tanner Gray (PS), Jay Turner (TFH). Oct. 29, 2017--NHRA Toyota Nationals, won by Terry McMillen (TF), Matt Hagan (FC), Greg Anderson (PS), Eddie Krawiec (PSM). April 8, 2018--DENSO Spark Plugs NHRA Four-Wide Nationals, won by Steve Torrence (TF), J.R. Todd (FC), Vincent Nobile (PS). Oct. 28, 2018--NHRA Toyota Nationals, won by Steve Torrence (TF), J.R. Todd (FC), Bo Butner (PS), Hector Arana Jr. (PSM). April 7, 2019--DENSO Spark Plugs NHRA Four-Wide Nationals, won by Mike Salinas (TF), J.R. Todd (FC), Bo Butner (PS), Hector Arana Jr. (PSM). Since its opening in 1996, Las Vegas Motor Speedway has played host to some of the most exciting racing under the bright lights of Las Vegas. 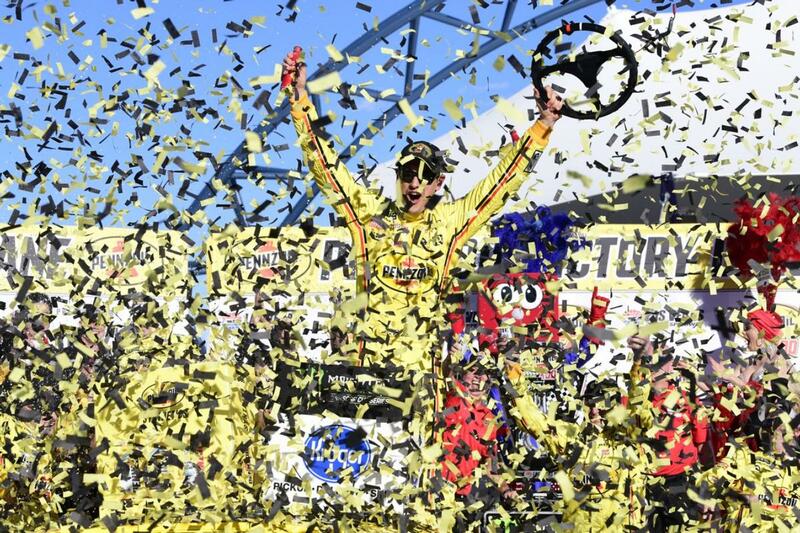 Check out statistics and records held at LVMS in each series.